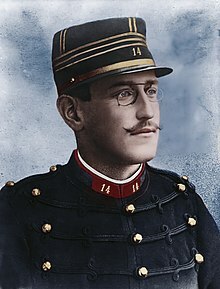 Alfred Dreyfus (French: [al.fʁɛd dʁɛ.fys]; 9 October 1859 – 12 July 1935) was a French Jewish artillery officer whose trial and conviction in 1894 on charges of treason became one of the most tense political dramas in modern French history with a wide echo in all Europe. Known today as the Dreyfus affair, the incident eventually ended with Dreyfus's complete exoneration. 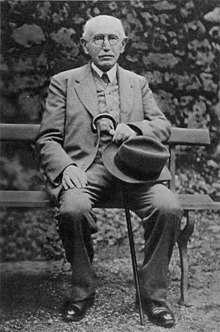 Born in Mulhouse, Alsace in 1859, Dreyfus was the youngest of nine children born to Raphaël and Jeannette Dreyfus (née Libmann). Raphaël Dreyfus was a prosperous, self-made Jewish textile manufacturer who had started as a peddler. Alfred was 10 years old when the Franco-Prussian War broke out in the summer of 1870, and his family moved to Paris following the annexation of Alsace-Lorraine by Germany after the war. The childhood experience of seeing his family uprooted by the war with Germany prompted Dreyfus to decide on a career in the military. Following his 18th birthday in October 1877, he enrolled in the elite École Polytechnique military school in Paris, where he received military training and an education in the sciences. In 1880, he graduated and was commissioned as a sub-lieutenant in the French army. From 1880 to 1882, he attended the artillery school at Fontainebleau to receive more specialized training as an artillery officer. On graduation he was assigned to the Thirty-first Artillery Regiment, which was in garrison at Le Mans. 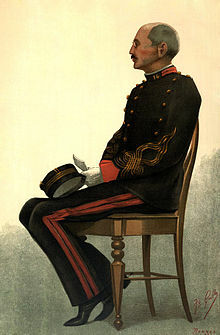 Dreyfus was subsequently transferred to a mounted artillery battery attached to the First Cavalry Division (Paris), and promoted to lieutenant in 1885. In 1889, he was made adjutant to the director of the Établissement de Bourges, a government arsenal, and promoted to captain. On 18 April 1891, the 31-year-old Dreyfus married 20-year-old Lucie Eugénie Hadamard (1870–1945). 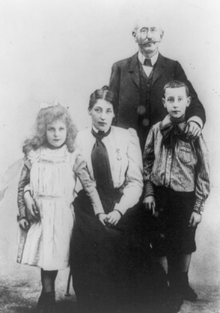 They had two children, Pierre (1891–1946) and Jeanne (1893–1981). Three days after the wedding, Dreyfus learned that he had been admitted to the École Supérieure de Guerre or War College. Two years later, he graduated ninth in his class with honorable mention and was immediately designated as a trainee in the French Army's General Staff headquarters, where he would be the only Jewish officer. His father Raphaël died on 13 December 1893. At the War College examination in 1892, his friends had expected him to do well. However, one of the members of the panel, General Bonnefond, felt that "Jews were not desired" on the staff, and gave Dreyfus poor marks for cote d'amour (French slang: attraction; translatable as likability). Bonnefond's assessment lowered Dreyfus's overall grade; he did the same to another Jewish candidate, Lieutenant Picard. Learning of this injustice, the two officers lodged a protest with the director of the school, General Lebelin de Dionne, who expressed his regret for what had occurred, but said he was powerless to take any steps in the matter. The protest would later count against Dreyfus. The French army of the period was relatively open to entry and advancement by talent, with an estimated 300 Jewish officers, of whom ten were generals. However, within the Fourth Bureau of the General Staff, General Bonnefond's prejudices appear to have been shared by some of the new trainee's superiors. The personal assessments received by Dreyfus during 1893/94 acknowledged his high intelligence, but were critical of aspects of his personality. In 1894, the French Army's counter-intelligence section, led by Lieutenant Colonel Jean Sandherr, became aware that information regarding new artillery parts was being passed to the Germans by a highly placed spy, most likely on the General Staff. Suspicion quickly fell upon Dreyfus, who was arrested for treason on 15 October 1894. On 5 January 1895, Dreyfus was summarily convicted in a secret court martial, publicly stripped of his army rank, and sentenced to life imprisonment on Devil's Island in French Guiana. Following French military custom of the time, Dreyfus was formally degraded (cashiered) by having the rank insignia, buttons and braid cut from his uniform and his sword broken, all in the courtyard of the École Militaire before silent ranks of soldiers, while a large crowd of onlookers shouted abuse from behind railings. Dreyfus cried out: "I swear that I am innocent. I remain worthy of serving in the Army. Long live France! Long live the Army!" In August 1896, the new chief of French military intelligence, Lieutenant Colonel Georges Picquart, reported to his superiors that he had found evidence to the effect that the real traitor was a Major Ferdinand Walsin Esterhazy. Picquart was silenced by being transferred to the southern desert of Tunisia in November 1896. When reports of an army cover-up and Dreyfus's possible innocence were leaked to the press, a heated debate ensued about anti-Semitism and France's identity as a Catholic nation or a republic founded on equal rights for all citizens. Esterhazy was found not guilty by a secret court martial, before fleeing to England. Following a passionate campaign by Dreyfus's supporters, including leading artists and intellectuals such as Émile Zola, he was given a second trial in 1899 and again declared guilty of treason despite the evidence in favor of his innocence. The government of the Republic has given me back my freedom. It is nothing for me without my honor. For two years, until July 1906, he lived in a state of house-arrest with one of his sisters at Carpentras, and later at Cologny. On 12 July 1906, Dreyfus was officially exonerated by a military commission. The day after his exoneration, he was readmitted into the army with a promotion to the rank of major (Chef d'Escadron). A week later, he was made Knight of the Legion of Honour, and subsequently assigned to command an artillery unit at Vincennes. On 15 October 1906, he was placed in command of another artillery unit at Saint-Denis. Dreyfus was present at the ceremony removing Zola's ashes to the Panthéon in 4 June 1908, when he was wounded in the arm by a gunshot from a disgruntled journalist, Louis Gregori, in an assassination attempt. In 1937 his son Pierre published his father's memoirs based on his correspondence between 1899 and 1906. The memoirs were titled Souvenirs et Correspondance and translated into English by Dr Betty Morgan. Dreyfus had started corresponding with the marquise Marie Arconati Visconti in 1899 and began attending her Thursday (political) salons after his release. They continued correspondence until her death in 1923. Dreyfus's prison sentence on Devil's Island had taken its toll on his health. He was granted retirement from the army in October 1907 at the age of 48. As a reserve officer, he re-entered the army as a major of artillery at the outbreak of World War I. Serving throughout the war, Dreyfus rose to the rank of lieutenant colonel. By then in his mid-50s, Dreyfus served mostly behind the lines of the Western Front, in part as commander of an artillery supply column. However, he also performed front-line duties in 1917, notably at Verdun and on the Chemin des Dames. He was promoted to the rank of Officier de la Légion d'honneur in November 1918. Dreyfus's son Pierre also served throughout the entire war as an artillery officer, receiving the Croix de guerre. A statue of Dreyfus holding his broken sword is located at Boulevard Raspail, n°116–118, at the exit of the Notre-Dame-des-Champs metro station. A duplicate statue stands in the courtyard to the Museum of Jewish Art and History in Paris. Captain Alfred Dreyfus's grandchildren donated over three thousand documents to the Musée d'art et d'histoire du judaïsme (Museum of Jewish art and history), including personal letters, photographs of the trial, legal documents, writings by Dreyfus during his time in prison, personal family photographs, and his officer stripes that were ripped out as a symbol of treason. The museum created an online platform in 2006 dedicated to the Dreyfus Affair. In an episode of the television series The Munsters, Herman and Lily Munster reflect on their honeymoon on Devil's Island. Longing for another special night like that, Herman remarks that they should have stayed in touch with Captain Dreyfus, clearly a reference to the exiled captain. Florence Earle Coates, a Philadelphia poet, wrote four poems about the Dreyfus affair: two entitled "Dreyfus", one published in 1898 and the other in 1899, "Picquart," (1902), and "Le Grand Salut" (1906). ^ Read, Piers Paul (2012). The Dreyfus Affair. p. 83. ISBN 978-1-4088-3057-4. ^ Read. The Dreyfus Affair. p. 84. ^ Read. The Dreyfus Affair. p. 113. ^ "Summary of Emile Zola's J'Accuse, and its Repercussions. Dreyfus Letter to Zola's Widow, 1910". SMF Primary Sources. Shapell Manuscript Foundation. Michael Burns, Dreyfus: a family affair 1789–1945 (1991), Harpercollins. ISBN 978-0-06-016366-2. Wikimedia Commons has media related to Alfred Dreyfus. "Dreyfus, Alfred" . Encyclopædia Britannica (11th ed.). 1911. "Dreyfus, Alfred" . New International Encyclopedia. 1905.